Welcome to Our Taxi Blog Taxidepot Mag: Life + Ideas + Anecdotes & Annotations in Between Rides. Please talk about taxis to us. Who stole the real cover ?! While doing a little research about taxi history I came across a book which probably too many already know: “TAXI! 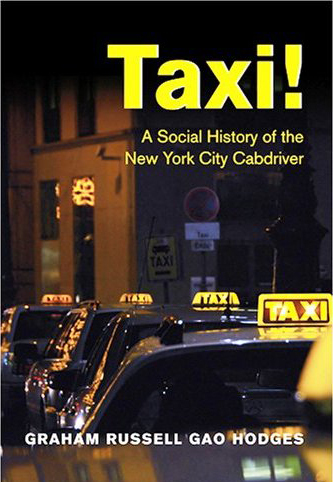 A Social History of the New York City Cabdriver”. Written by Hodges, Graham Russell Gao. The book was published in 2007 by Johns Hopkins U. Press and believe me, I can't wait to get my hand on a copy!! However, what triggered my interest was the mismatch of cover art the publisher chose for this book: A contemporary full color night shot of a caravan of taxis clearly displaying their European style rooflight!!! c'mon, you can do better than that!! Any New Yorker knows very well how their cab's top-lights look like. They could have used a truly New York Icon, a Yellow Checker Cab, which by itself represents better the city, the drivers and their taxi history. The title, however, made me research deeply about the book, and I found amazing references as the ones found in Google-book and the New York Times. Check out the latest in Taxi Art!! !